The best mattress topper for side sleepers can make a huge difference in how you sleep at night. Side sleepers require different support than back or stomach sleepers. Why? Because they put a lot of pressure on only one side of their body. Because this pressure is not distributed over the whole body, side sleeping can lead to a sore back and hips without proper support. If your mattress isn’t cutting it, adding a mattress pad is an inexpensive, effective way to rest more comfortably. 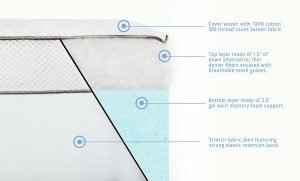 When putting together this review, we considered some of the most important features when it comes to a mattress pad for side sleepers. We took material and thickness into account because those are the things that determine the level of support. The sizes a product is available in matters, too, because every topper should feel as comfortable as possible on your mattress. Finally, we took warranty information into consideration because it’s important to make sure you get a product that’s meant to last. 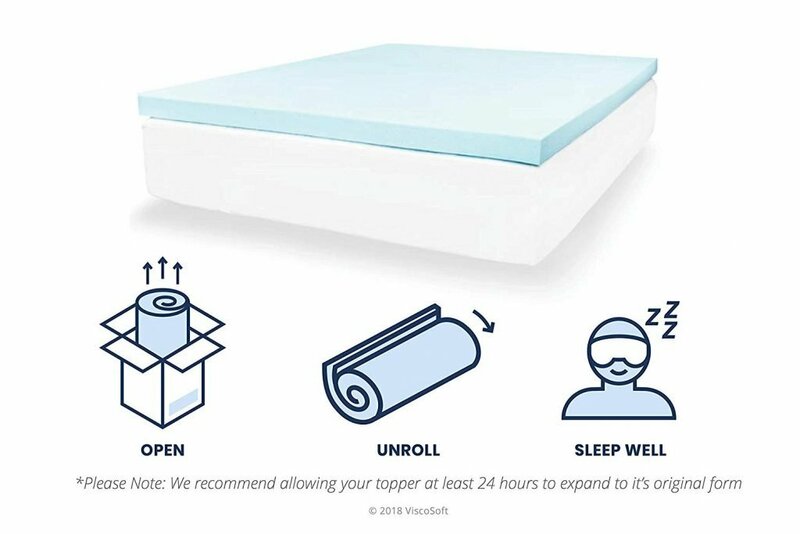 To put this review together, we spent hours researching mattress toppers as well as reading reviews and comments from the people who actually sleep on them every night. 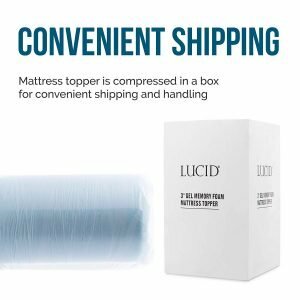 The first thing you’ll find is a table where you can compare each of our picks for the best mattress topper for side sleepers together in one place. After that, you’ll find out individual in-depth reviews and finally a buying guide to help you figure out which of these products is the right one for you. The ViscoSoft 4-Inch Dual Layer Mattress Topper is the best foam mattress topper for side sleepers we could find. 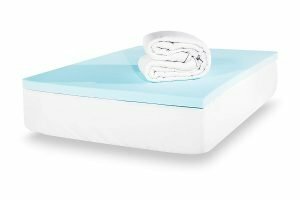 It features a 2.5-inch supportive base layer of gel-infused memory foam and a top layer of 1.5-inch fluffy down alternative. Not only is the design really breathable, but the foam is also infused with cooling gel to help regulate temperature. While it does the trick for some people, other users reported that they still slept a little hot with this topper. Another great thing about this topper is the cover. It’s made of 300 thread count sateen fabric that’s hypoallergenic which makes this a great choice for anyone who suffers from allergies or dry skin. It’s also easy to remove and can be tossed in the washing machine for cleaning. Once the cover is dry, putting everything back together is simple. It’s easy to use elastic straps to secure the memory foam and a strong elastic band. The design resembles a fitted sheet and easily secures to any mattress 18-inches thick or less. It takes 24 to 48 hours for this topper to completely expand. There’s a chemical smell initially as with most memory foam products, but it should go away pretty quickly as the pad airs out. This is a well-made mattress topper and the company really stands behind it. In addition to the 3-year warranty, it also comes with a 60-day satisfaction guarantee. Try the topper out for 60 days and if you don’t like it, simply return it for a full refund. 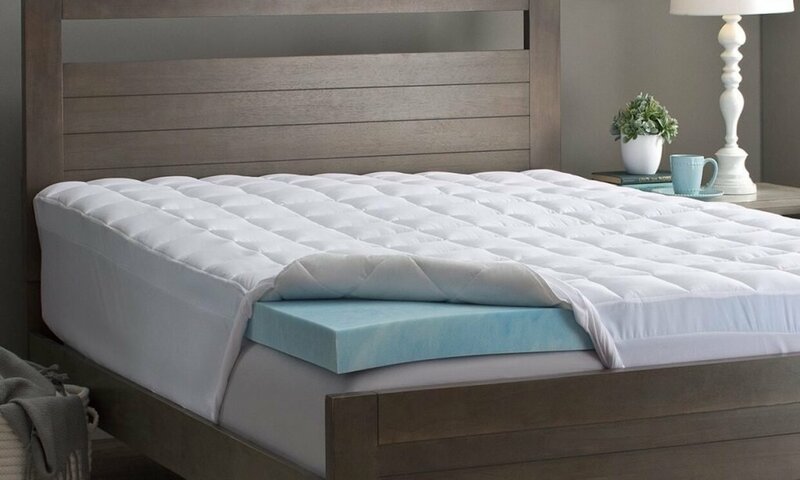 The ViscoSoft 3-Inch Mattress Topper is a cool and comfortable choice with gel-infused memory foam that traps body heat and a ventilated design to distribute it, which keeps you cool at night. One thing that stands out about this topper is the high-density foam. 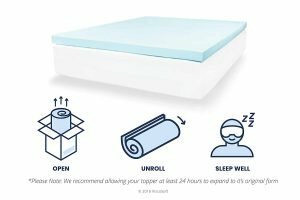 Not only does it relieve pressure points and align your spine, but it does it without the sinking that’s common in a lot of these mattress toppers. 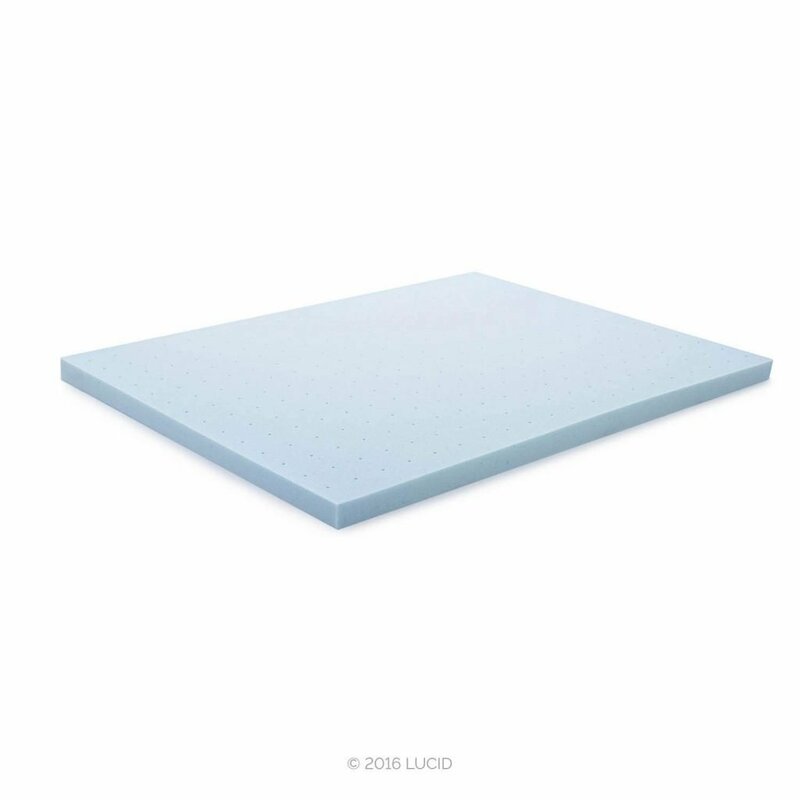 This topper uses heavier foam that provides more support and stays firm for a longer period. This product comes with a removable, machine washable cover. 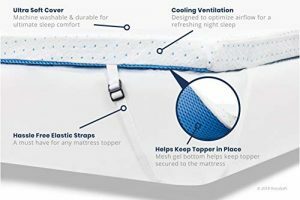 It has slip-resistant mesh and adjustable elastic straps to keep it in place without having to constantly make adjustments, though the straps may not fit properly on very thick mattresses. It’s also hypoallergenic and a great choice for anyone with allergies or sensitive skin. Most users agree that any chemical odor goes away very quickly but some people did experience issues with it lingering around for a while. Another downside is that some people have found it takes a long time for the foam recover and that indents left while sleeping can be uncomfortable if you change position. This mattress topper comes with a 3-year warranty against manufacturer defects as well as a 60-day no hassle money-back guarantee. If you don’t like it, return it in that time from for a full refund. The Zinus 2-Inch Gel Memory Foam Mattress Topper is a thinner option that features 2 inches of gel memory foam for cooling support. 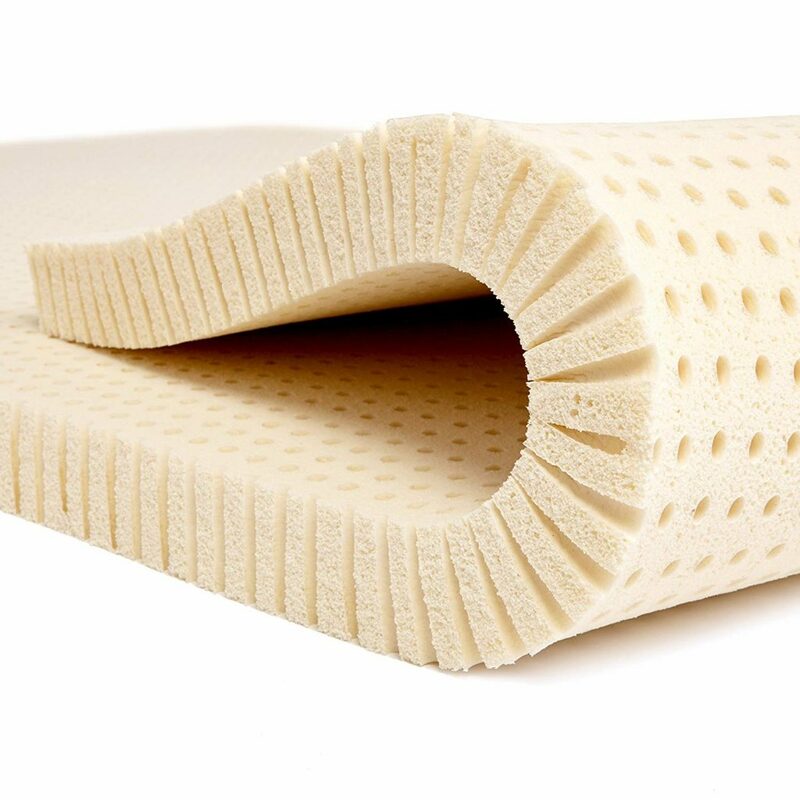 Rather than standard memory foam, Zinus uses Biofoam which uses natural plant oil instead of petroleum. That’s not all, there are natural green tea extract and active charcoal integrated into the foam to help absorb moisture, eliminate odors, and help keep everything feeling fresh. 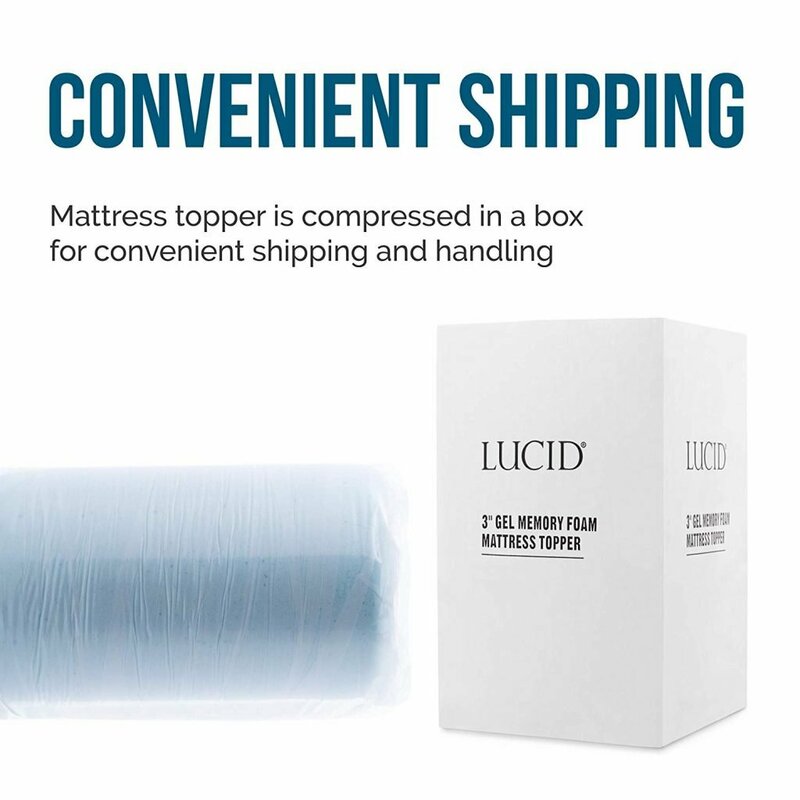 There’s no cover included with this topper because it’s thin enough to fit under a standard or deep-pocket fitted sheet. It also doesn’t have as many issues with heat retention as thicker mattress toppers do though some people still felt too warm at night. It can take about 48 hours for this product to expand to its original size, but some users have commented that it falls a few inches short of the dimensions of their queen-sized mattresses. This mattress topper has a pretty impressive 5-year limited warranty. While there is a chemical smell when you first open it, it usually goes away in a few days though some users did mention that it lingered for a while longer. 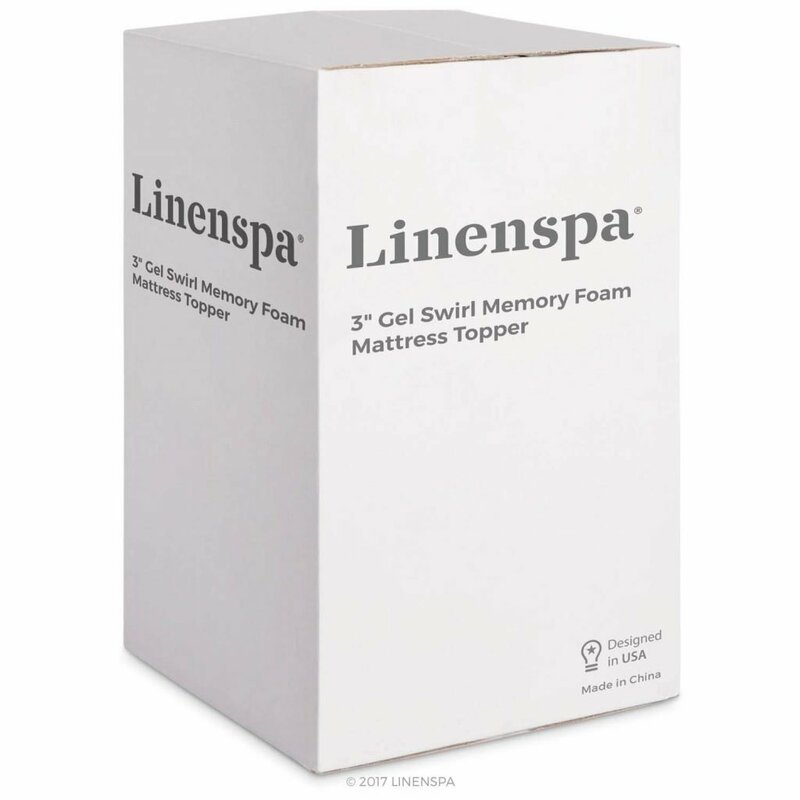 This light, breathable Linenspa 3-Inch Gel Swirl Memory Foam Topper is made up of a single layer of plush, gel-infused memory foam that provides a lot of support and helps you sleep a little cooler at night though some users felt that it was still too hot. The open-cell design conforms to the contours of your body to keep everything aligned and take pressure off your joints. 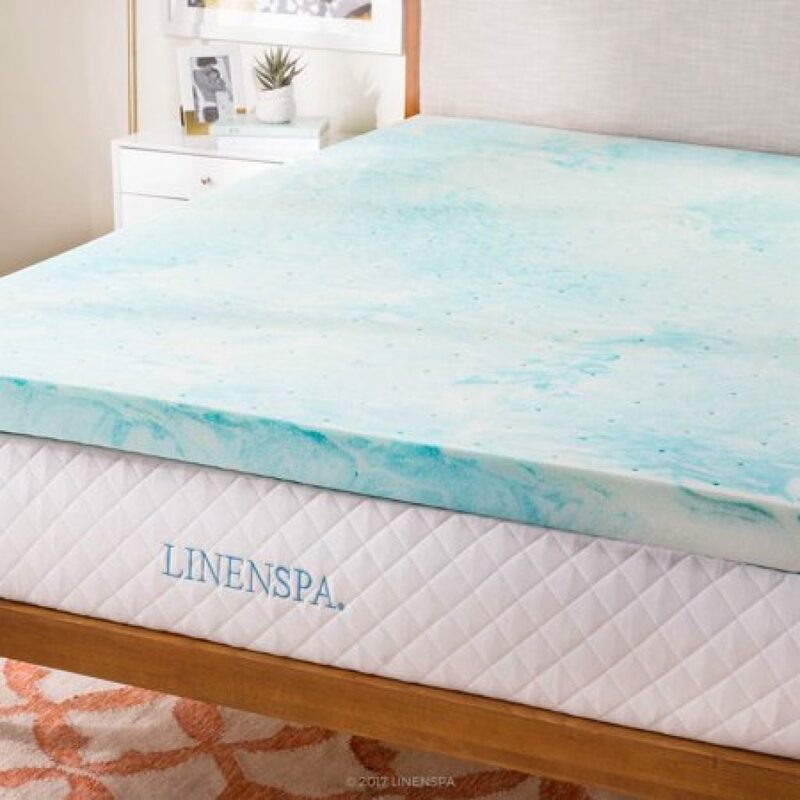 What’s cool about this topper is that you can actually see the gel as it creates a swirling pattern that goes throughout the memory foam. This really shows you how well the gel is infused and gives it a very contemporary look. One downside to this topper is that it doesn’t come with a cover. Some users reported that they added one which also helped with any problems they were having with being too hot. 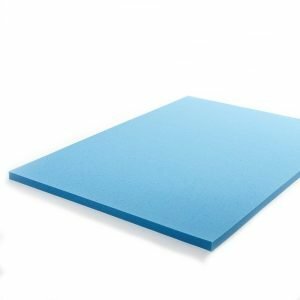 This 3-inch topper is a great thickness for most people but, because this topper is also really soft, it can make it a little difficult to get out of bed if you’re overweight or have issues with mobility. This topper can take up to 48 hours to expand completely. It does have a chemical smell that usually disappears after a few days but some users did claim that it lingered for a very long time. Some users have reported that it loses its support over time and that dips start to appear. It’s covered with a 3-year warranty, though, which should cover most of these issues. 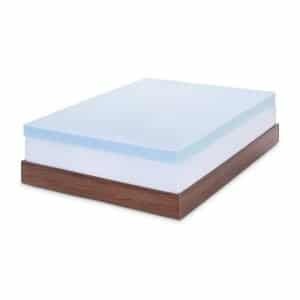 The best latex mattress topper for side sleepers on our list is this Pure Green 2-Inch Natural Latex Mattress Topper with medium firmness. It uses only 100% natural latex with no synthetic components or fillers. This is a perfect choice for anyone who is looking for a topper with somewhat firm, precise support. It’s made using a special process that causes the latex to be springy and supportive without being bouncy which makes it the perfect sleeping surface. This pure latex stays naturally cool so it really helps regulate your temperature. It’s actually heat neutral and won’t get soft or absorb body heat to deliver consistent support. Plus, one of the best things about latex is that it doesn’t have the same problems as memory foam can with sagging and sinking as time goes by. It maintains the same level of support throughout the night, which makes it the best mattress topper for heavy side sleepers. Like comparable memory foam toppers, this product also has a problem with a strong odor when you first take it out of the box. In most cases, it fades fairly quickly, but some users have complained that it sticks around for a while. One downside is that there’s no cover included and the surface can break down over time, especially if not protected. Because natural latex is also really durable, it’s no surprise that this product is covered by a 5-year warranty. Plus, Sleep On Latex, the company that makes this topper, has excellent customer service. 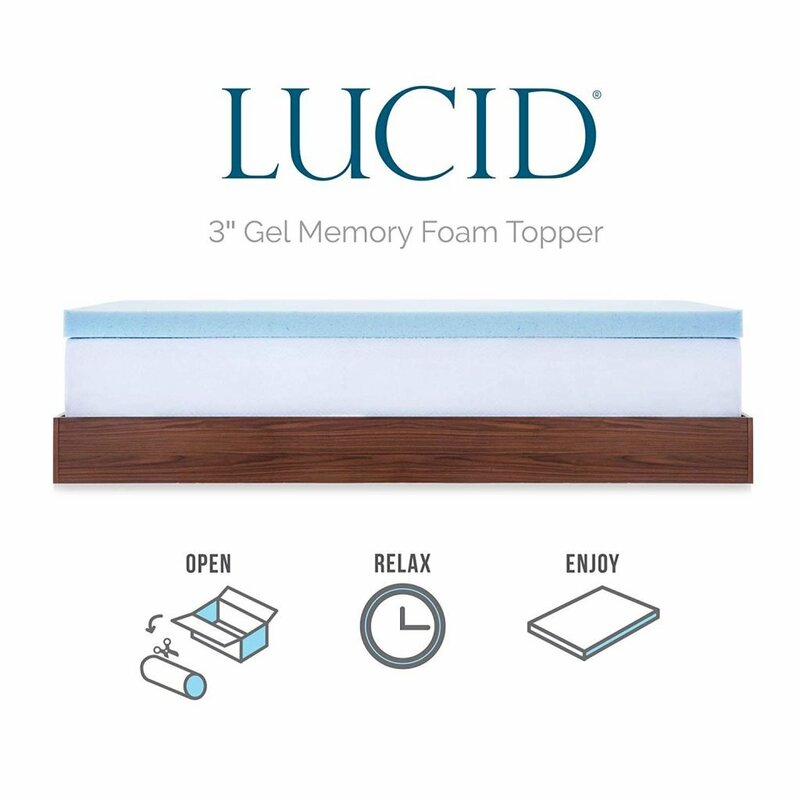 The memory foam used in the LUCID 3-Inch Gel Memory Foam Mattress Topper is soft and airy to improve airflow. It’s also infused with plush gel to capture and disperse heat to help you sleep cooler at night. While this topper is soft enough to contour to your body, it still gives you the support you need to keep your joints and spine in alignment, especially when sleeping on your side. In fact, some users reported that they slept in one position on their side all night long and woke up pain-free using this product. Something really great about this product is that it’s soft but not too soft. That said, some users have mentioned that it’s so soft, you can sink into it so much that it can be difficult to get out of bed. While all memory foam has an initial chemical smell that should go away after a few days, any odors from this topper seem to dissipate a lot quicker than expected. One issue with this topper is that it moves around a bit during the night if you toss and turn a lot in your sleep. This problem is pretty easy to solve with a mattress gripper or cover but these things are not included so you’ll have to purchase them separately. One look at the Sleep Innovations Gel Memory Foam 4-Inch Dual Layer Mattress Topper and you can see that it’s different. 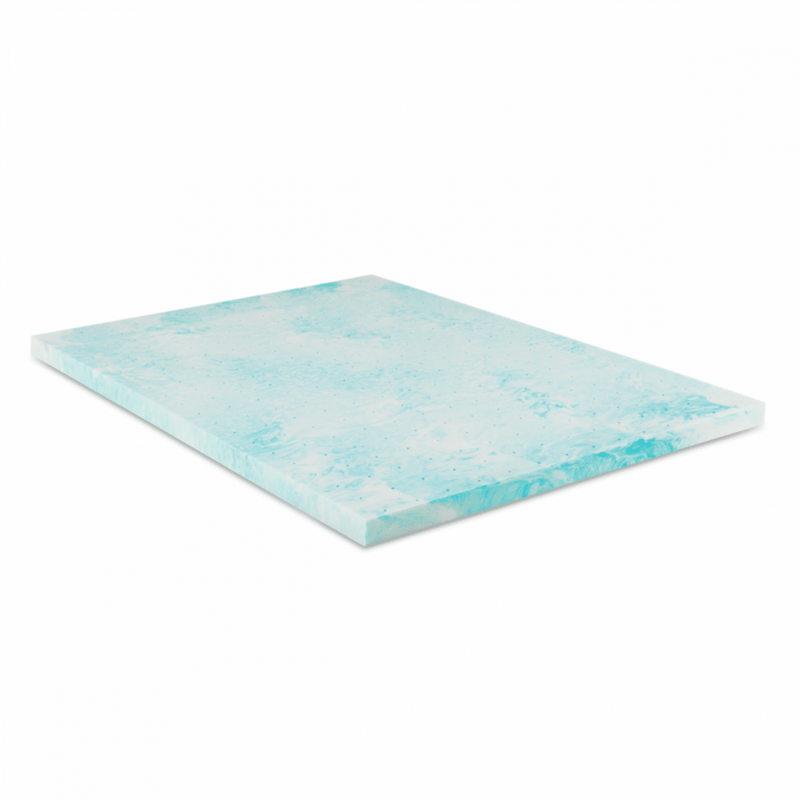 This dual layer 4-inch topper is made of a 2-inch layer of gel-infused memory foam as well as 2 inches of fluffy down alternative. 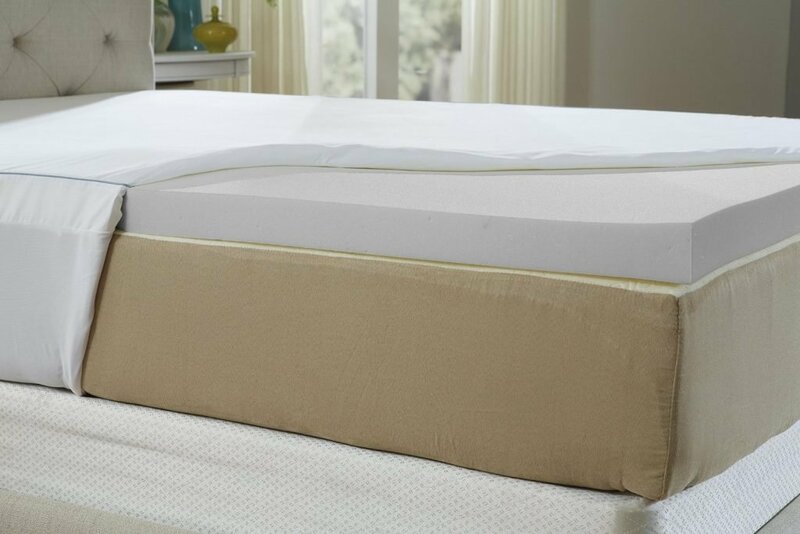 It gives you the support of memory foam with the soft feel of a pillow-top in one affordable package. That said, because the down alternative sits on top of the gel memory foam, it can retain more heat than other toppers. If you’re looking for something more than a memory foam topper, this is a really effective alternative. It’s great for side sleepers but works well with back and stomach sleepers, too, though some people stated that they had some issues with sinking over time. 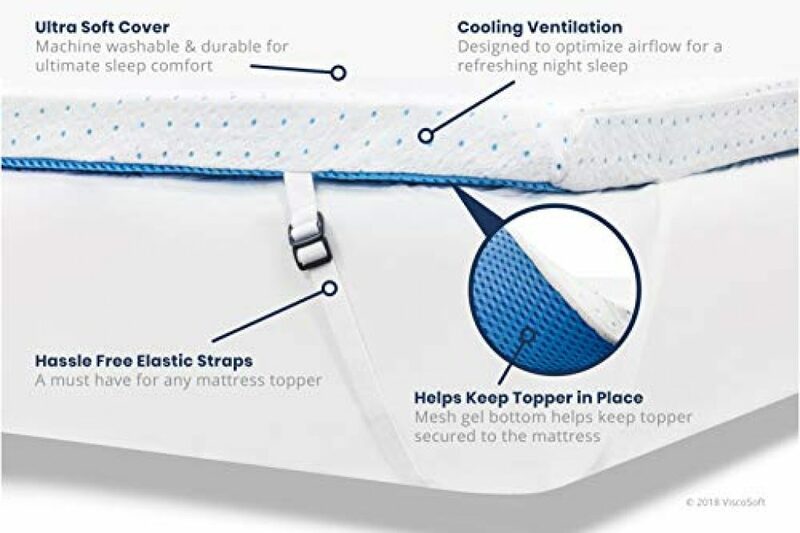 This topper comes with a machine-washable, dryer-safe cover that not only protects it from dirt and wear, it also helps hold everything in place so that it doesn’t shift around while you sleep. One of the most impressive things about this product is the 10-year limited warranty. That’s the longest coverage of all of the items we reviewed and provides a little extra peace of mind. That said, one of the downsides is that this topper can lose its shape and firmness over time and issues related to normal use may not be covered by the warranty. 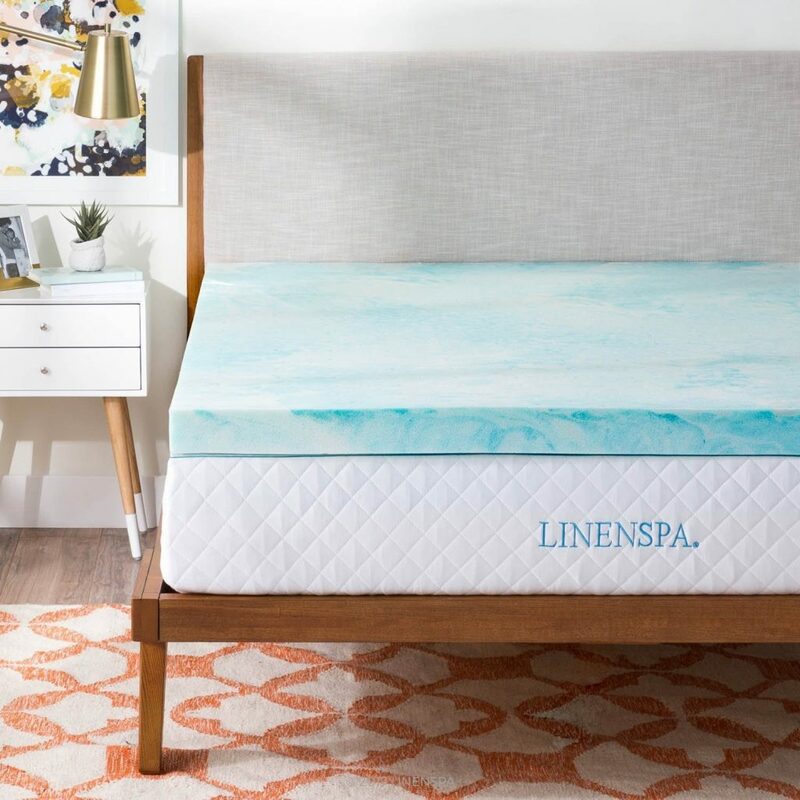 Whether you’re looking for the best mattress topper for cooling and side sleepers or the best organic mattress topper for side sleepers, there are a few features you should keep in mind to make sure you’re getting exactly what you need. Side sleepers have some special considerations that back and stomach sleepers don’t. When sleeping on your back or stomach, weight is distributed evenly across your whole body. This means that you’re less likely to have problems with pressure points because there isn’t any one part of your body that is taking the brunt of the pressure and, if there is, it’s relatively easy to use a pillow to elevate your legs or arms to prevent discomfort. When you sleep on your side, all of the pressure is focused on one side of your body. If you’re sleeping on a mattress that is already too soft, too firm, or not supportive enough, sleeping on your side can exacerbate your discomfort. The best mattress topper for side sleepers can alleviate this pain by providing the additional support you need to alleviate this pressure and support your joints and spine when you’re lying on your side. It’s a more affordable solution than getting a brand new mattress and you have the flexibility to find the one that suits your particular needs. 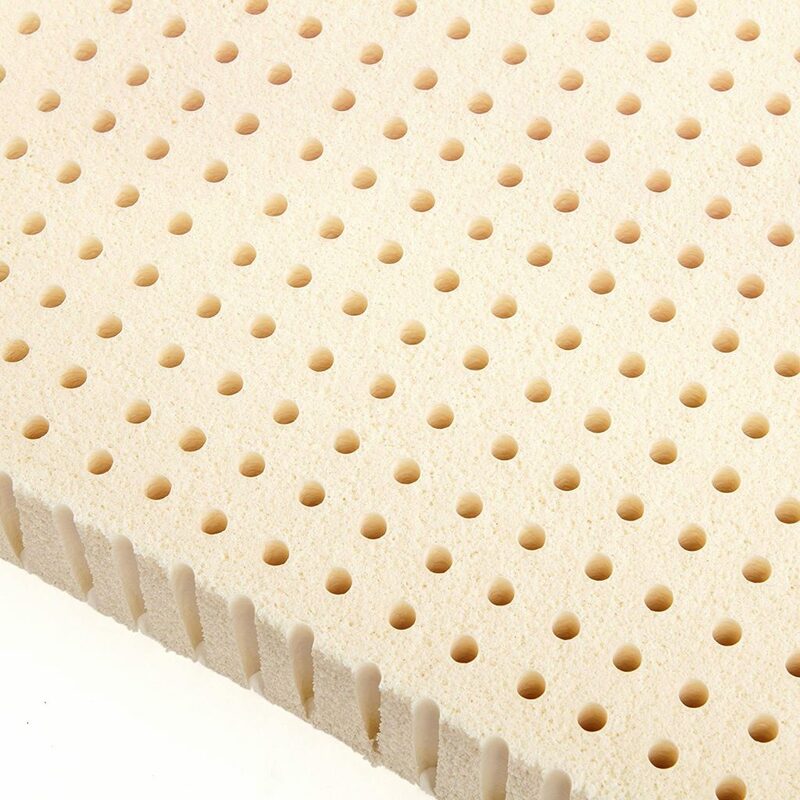 Not all of the best soft mattress topper for side sleepers are created the same. There are some important things to keep in mind when trying to figure out which is the right one for your sleep needs. 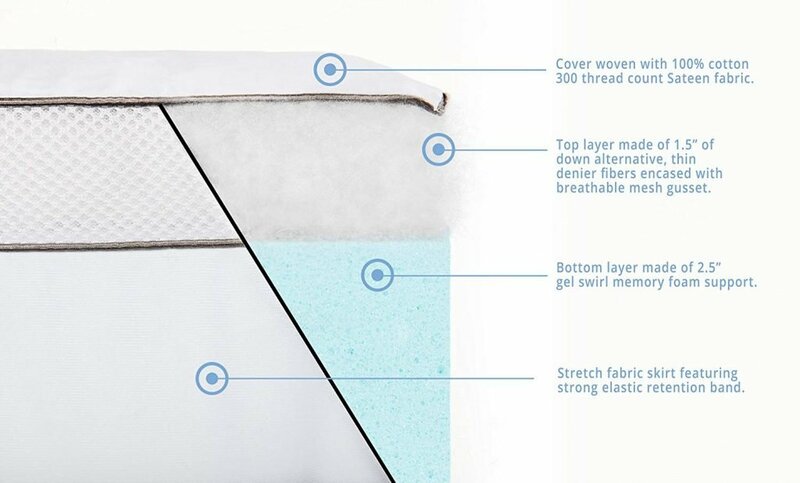 Most of these mattress toppers are made with memory foam that’s been infused with cooling gel. There are a few options, like the Zinus 2-Inch Gel Memory Foam Mattress Topper, that also contain things like green tea extract or active charcoal to help control moisture and odor. 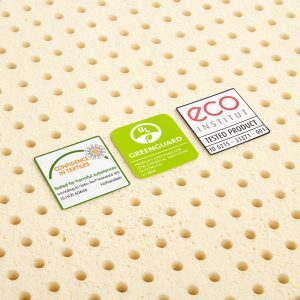 We found one product, the Pure Green 2-Inch Natural Latex Mattress Topper, that’s made of 100% natural latex. Latex has some of the same qualities as memory foam but it’s denser and tends to bounce back quicker. It’s also a lot heavier which can be a factor in moving it or rotating it regularly. Some of these mattresses include covers that are hypoallergenic which makes them great for anyone who suffers from allergies, asthma, or sensitive skin. These covers are usually easy to remove and can be thrown in the washing machine for regular care. 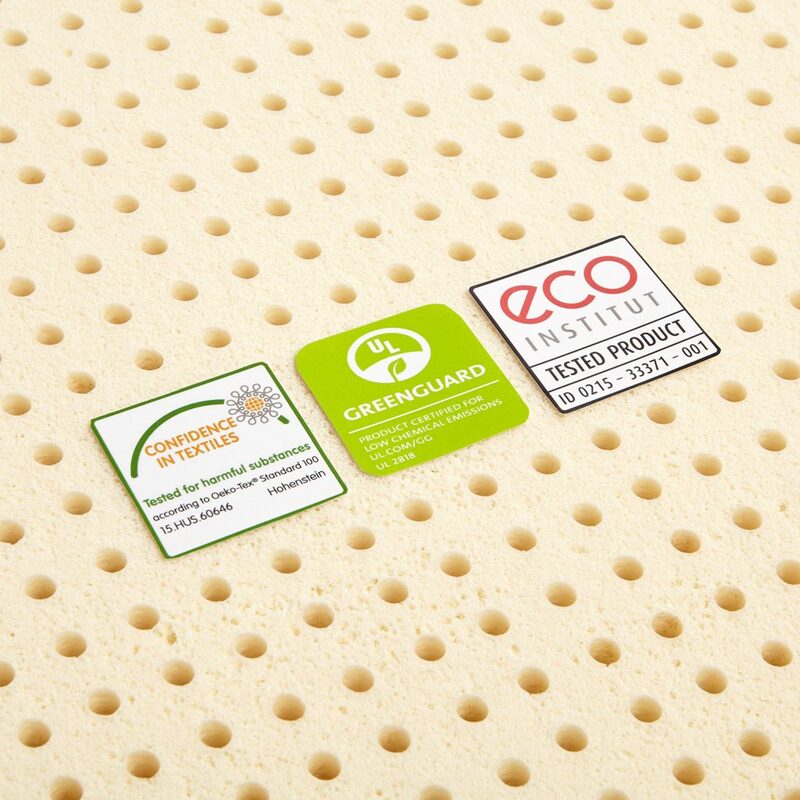 One way you can judge the quality of one of these best mattress topper for side sleepers is to make sure it’s CertiPUR-US certified. This means that it’s been verified and doesn’t have any ozone depleters, harmful flame retardants, heavy metals, and was made with low VOC emissions for air quality. It’s perfectly normal for these mattress toppers to have a strong smell initially though this should go away after about 48 hours. Most mattress toppers will have the same feel no matter how thick they are but a thicker profile means there’s more material to cradle you. When deciding how thick your topper needs to be, one thing that you need to consider is your weight. The heavier you are, the deeper you will sink into the topper so you should invest in one that’s a little bit thicker. Luckily, there are mattress toppers available for mattresses of any size. 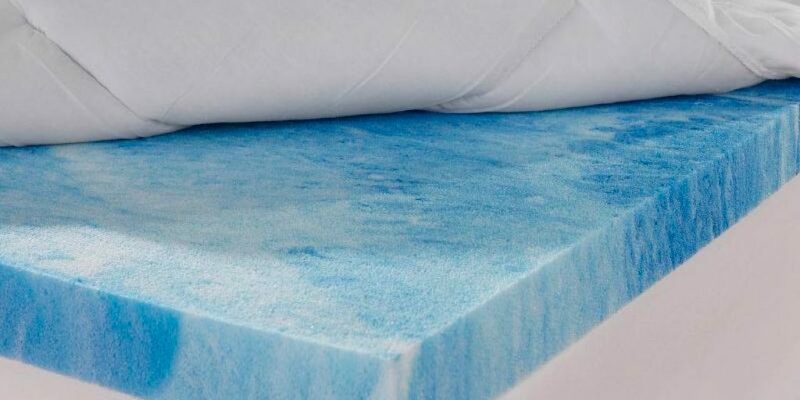 So, whether the mattress you currently share with your spouse isn’t cutting it anymore or the one that you got stuck within your dorm room is making your life miserable, you should be able to find the best cooling mattress topper for side sleepers that fits your mattress. 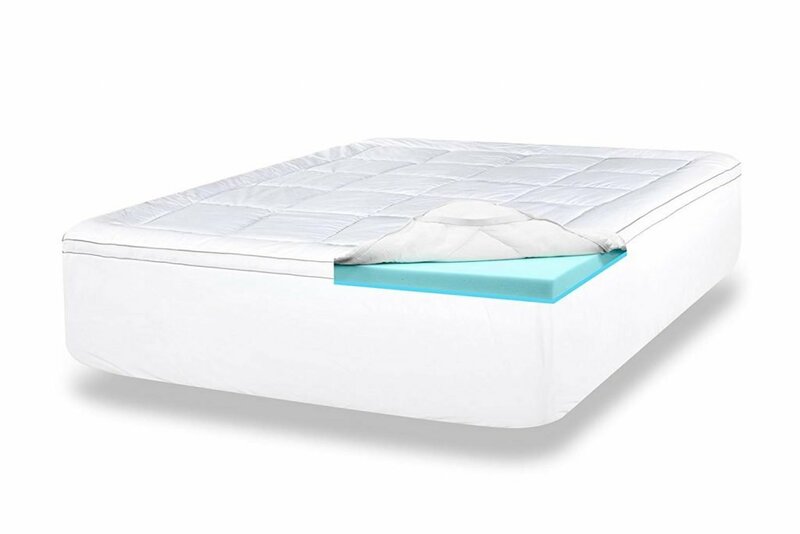 Keep in mind that you want the mattress topper to be slightly smaller than the mattress itself primarily so you can place it under the same fitted sheet without causing any uncomfortable bulges or ridges around the edges. 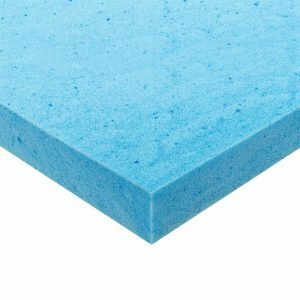 We touched on this briefly when talking about the material and thickness but, in addition to choosing thick foam, it’s also important to choose one that’s dense if you need a lot of support. It’s more durable and can tolerate more weight than softer, more forgiving materials. Warranties are always important and most toppers are covered for 3 or 5 years, though the Sleep Innovations 4-Inch Dual Layer Mattress Topper is covered for 10. These warranties generally cover manufacturing defects and won’t cover anything that happens as a result of normal wear and use. Make sure you read the warranty information carefully so you know what’s covered. What mattress firmness do I need if I’m a side sleeper? It depends. Generally, you need something that’s firm enough to support you while being soft enough to keep your comfortable so it really boils down to personal preference. That said, if you’re overweight or have problems with mobility, a firmer mattress topper might be a better choice because it provides the support you need so you don’t sink too far in. Can a topper change the firmness of my mattress? No. 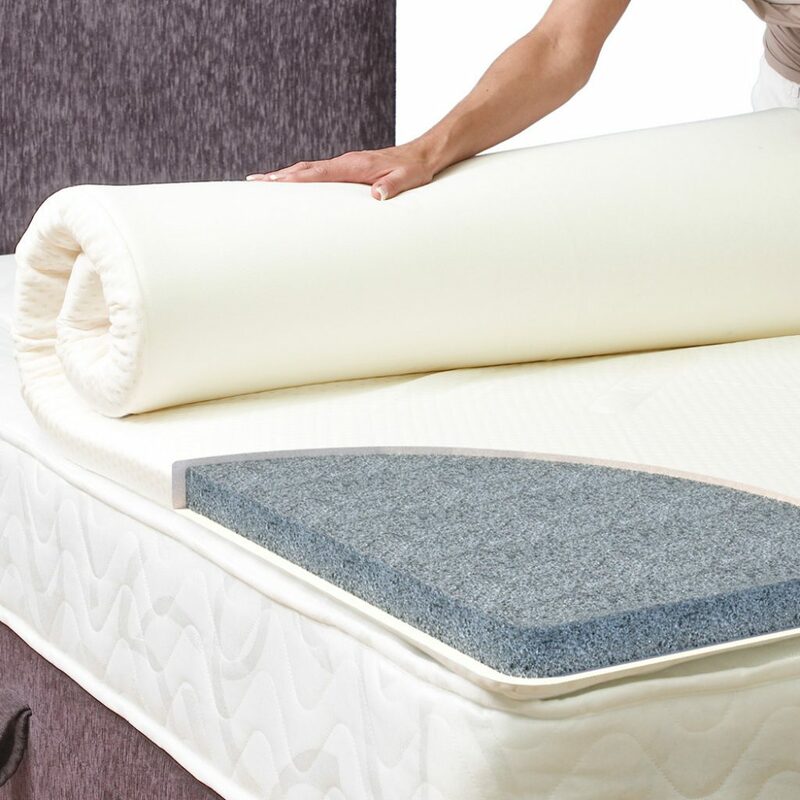 Your underlying mattress is still going to be as hard or soft as it was before you put on the mattress topper. Ultimately, your mattress is still what’s giving you most of the support while you sleep. While the right mattress topper will make a difference in how your mattress feels, the bad one can amplify any imperfections. Can a topper be cut to size? It will be though, and it will most likely void any warranty. Make sure to use sharp, heavy-duty scissors and, like they always say, measure twice, cut once. 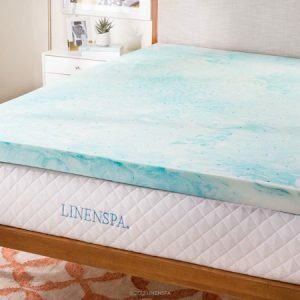 How do I clean and care for my mattress topper? One of the best ways to perform regular upkeep is to use a vacuum cleaner to remove anything from the surface. 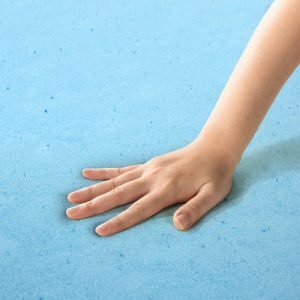 If there are any areas that need spot cleaning, you can use a combination of baking soda and water. The easiest way to take care of your mattress topper is to get one that has a removable cover or invest in one if there isn’t any included. Our top pick from our best mattress topper for side sleepers is the ViscoSoft 4-Inch Dual Layer Mattress Topper. 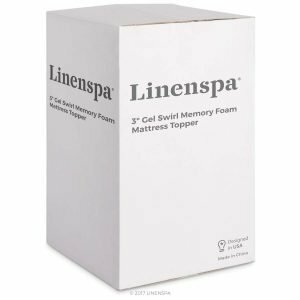 The combination of gel-infused memory foam and down alternative is both breathable and comfortable and the removable sateen cover makes caring for your mattress topper really easy. The ViscoSoft 3-Inch 3.5 lbs. Density Mattress Topper is our second choice and the best mattress topper for side sleepers with shoulder or back pain. 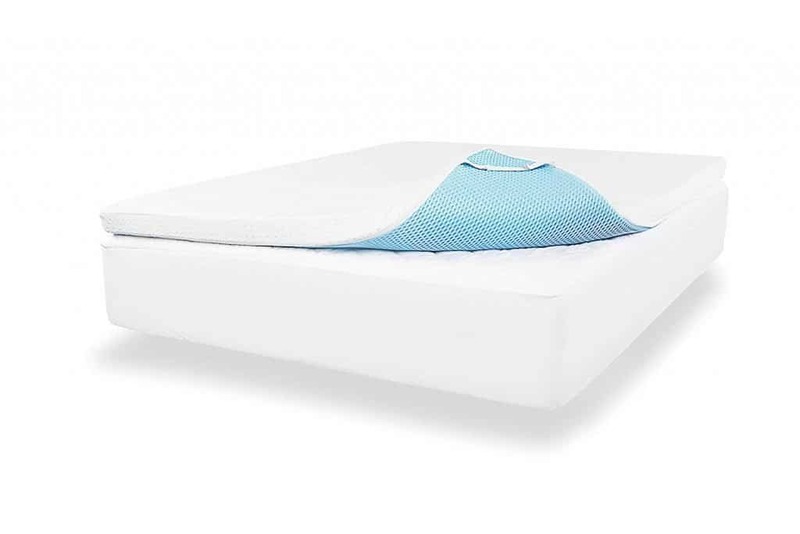 The vented, gel-infused design traps body heat and disburses it while you sleep and the high-density foam provides a lot of support and stays firmer, longer. 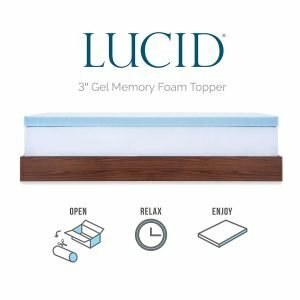 A good choice for the best mattress topper for side sleepers who sleep hot is the Zinus 2-Inch Gel Memory Foam Mattress Topper. It uses natural plant oil, green tea, and activated charcoal to wick away moisture and prevent odors. Plus, at only 2-inches thick, it traps less heat than thicker and denser products and is very affordable.